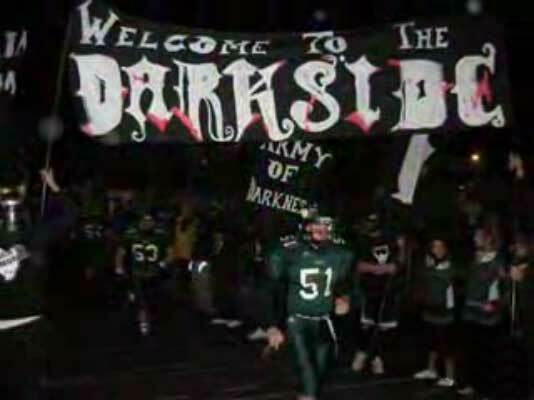 Fremd High School “Welcome to the Darkside” and “Army of Darkness” banners (still frame from YouTube post below). The IHSA (Illinois High School Association) has reviewed a melee after the Glenbard North High School victory at Glenbard North High School in Carol Stream [MAP/SAT]. Since no football players were involved in the fighting that occurred during the post-game celebration, Glenbard North High School (8-4) will keep its victory and move on to play Mt. Carmel (12-0) at Mt. Carmel High School Saturday at noon [MAP/SAT]. Map of Mt. Carmel High School is the location of the Chicago Mt. Carmel. Many Fremd fans are claiming that Glenbard North students charged the field and visitor’s grandstand where Fremd High School fans were standing after the game. Glenbard North students are claiming they were circling the track in a traditional post-game victory celebration when Fremd fans pelted them with beer bottles, water bottles and garbage — and that’s when the Glenbard North fans infiltrated the visitor’s grandstand. Adults from Fremd also witnessed Glenbard North students and parents wearing Glenbard North school spirit gear taunting exiting Fremd High School football players with insults and profanities. About 20 Fremd High School football helmets, a camera, and athletic bags were stolen from the Fremd sidelines after the game. There were also reports of parents assaulting students. YouTube post of a tribute to Fremd fans shows Fremd “Army of Darkness” black spirit attire that includes clips from Glenbard North game. No video of the post-game aftermath. Tension between the two high schools was increased after Fremd students posted an “Army of Darkness” YouTube video and blog that touted that the only reason Glenbard North High School would draw a crowd would be to honor their band director that recently died. William R. Schraft, 50, the music department chairman and band director at Glenbard North High School died Wednesday, October 31, at the University of Chicago Hospital of complications during his one-year battle with cancer. A large number of Fremd High School fans wear black to be a part of the “Army of Darkness” to show off school spirit. There were also references to invading Glenbard’s stadium. Fremd High School is a public high school in District 21 located in Palatine, Illinois [MAP/SAT]. Glenbard North student video showing a better day with Mr. Schraft dancing — posted on YouTube on the day of William Schraft’s death, October 31. Carol Stream Police Department made no arrests and no charges were filed against any students or adults. Apparently there was difficulty identifying specific offenders.